Some things are not as they seem in the world. The sewing craft is a master at perfecting smart and sensible trickery with creative pattern designs but when combined with an illusionary fabric…bam! Get ready for some seriously fun confusion in the form of wearable art. Oversized pleats – a simple staple technique – go on overkill and completely make this Burda Style dress unique but incredible comfy. I might look nice in it but it is so easy to stay in and so swingy and feminine! The relaxed fit and flowing silhouette is a nice change from many of the tailored garments I so often make, but this dress still has its own complimentary shape that took some getting used to. FABRIC: The printed fashion fabric is a unique polyester sheer. It is made like a delicate woven, the way it acquires runs easily, and it has a sort of flat “grid-like” design in the fabric (apart from the print) where every other block is sheer and the others are solid. I do not know what this kind of fabric is and I’ve never again (yet) seen anything like it…one of the reasons I’ve held onto it in my stash for maybe 10 years. The lining is a solid black poly pongee. NOTIONS: I had the thread, bias tape, and zipper on hand already. I did have to go out recently and buy the aluminum chain (more on this later). THE INSIDES: All bias bound. TIME TO COMPLETE: This dress was more involved than I’d originally thought (with the lining and the fitting) so it took me about 15 to 20 hours to make. It was done on November 16, 2015. TOTAL COST: Both fabrics were in my stash together for maybe a decade so I’m counting them as free, with my only expense being the chain, which was around $5.00. The fabric’s print calls to my mind the psychedelic era of the 60’s or 70’s, like what I would imagine some trippy vision of a dance floor would look like to someone on a ‘high’. It also reminds me of the checkered pattern used in car racing (with red rather than the rust orange in my fabric), like in the modern “Speed Racer” movie where he’s driving so fast the block print swirls and twists before him like he’s burning up the track. But, in the back of my mind I can’t help but think of it being an evil harlequin print (like in Cezanne’s painting). Harlequins (especially the English ones) are masters at trickery and disguise, making what you see and what is really going on two different things. 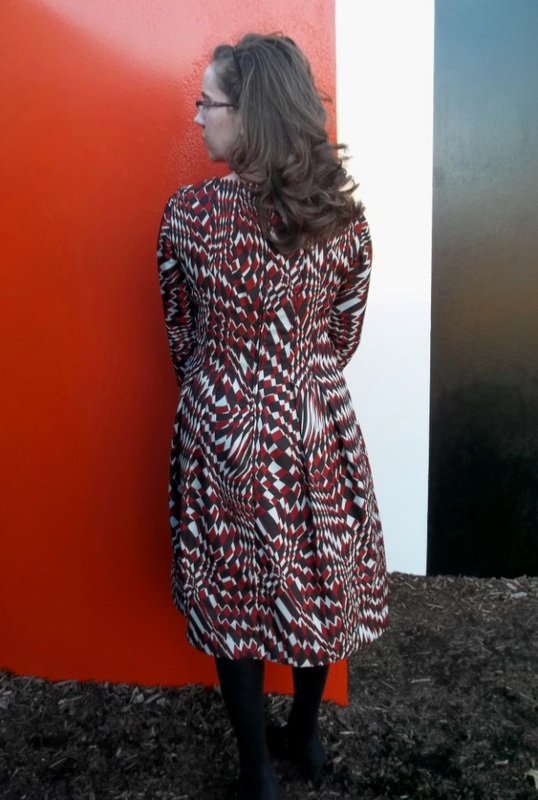 They also wear a print which has a similar pattern as the one on my dress…even though it’s bold and eye catching it also deceives the visual perception, much like the “dazzle camouflage” used on ships in World War I. So, with the “dazzle”, “psychedelic”, “harlequin” print (whew) of my fabric, my dress’ pattern further confuses things by having a bodice that looks like one piece at first, to open up leaving one to figure out where the fullness came from…at least this is how I see it without relying on knowing how it was made with tricky inverted pleats and sneaky fabric! Going into this project, I really wasn’t sure if the fabric would be too much for the pattern design or vise-versa. Actually, I really didn’t like it once it was made – as in “not liking it so much I was ready with both scissors and a new pattern to cut it into a new design” dislike. I was attached to the fabric after holding onto it for so many years in my stash and it is a unique material, so I really wanted to pair up the perfect project if I was going to use it. 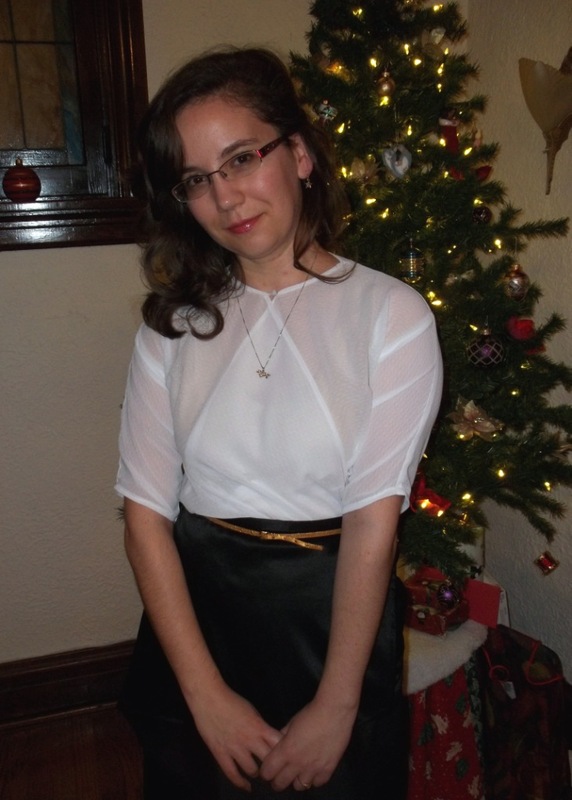 However, once my dress was worn and the hem tweaked a bit (more about this later), I was totally won over. After all, the Burda pattern is four years old now, and I don’t like the print they used. Also, the more ‘dated’ a pattern becomes (different from vintage), the more I have to think beyond what I see in the cover example to come up with something different. It’s unnerving for me to take a chance on my more special fabric (like this one) with a bold design idea, but becomes fun and worth it in the end. Truthfully though, if I was to see this dress “ready-to-wear”, I have a hunch I wouldn’t like it half as much as I do because it was self-made. 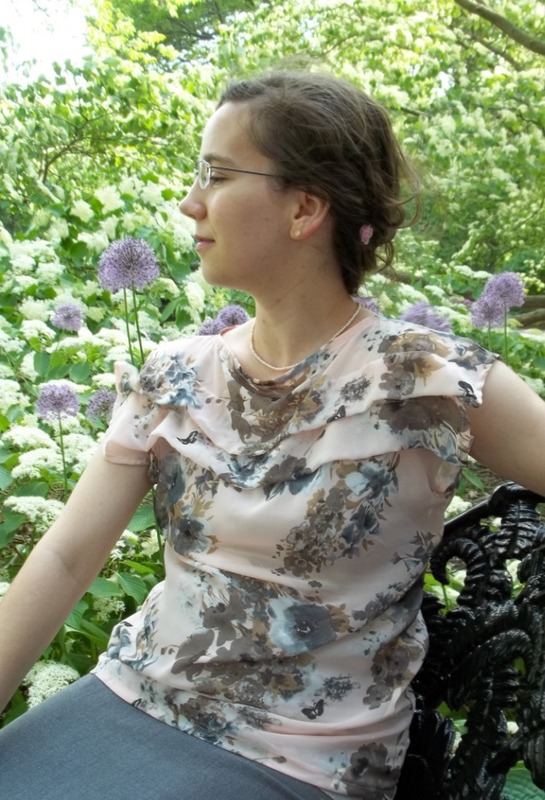 Back to practical construction info, this dress was pretty much made as-is, with no changes to the original design and cut out according to my traditional sizing as-per Burda Style. 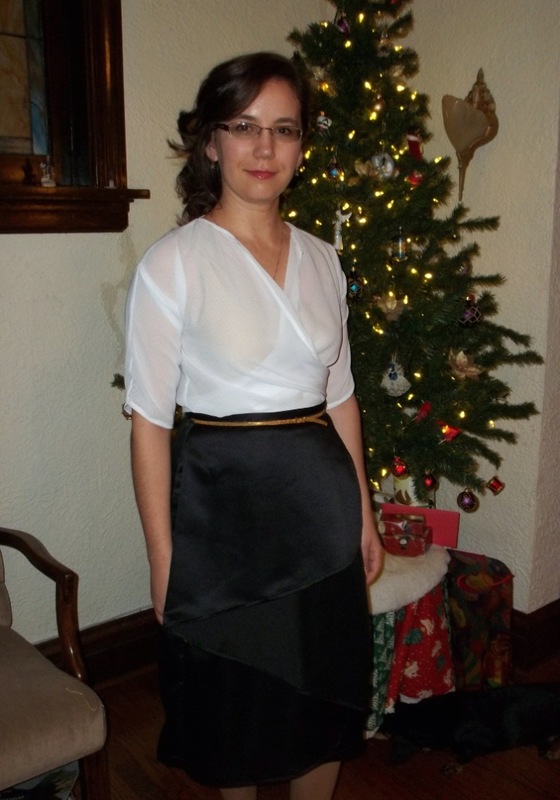 Oddly, it turned out quite generous in fit and way too long in the hem length. The dress still fits me a bit roomy, but I took in maybe an inch or so on the sides and made a wide 4 or 5 inch hem. 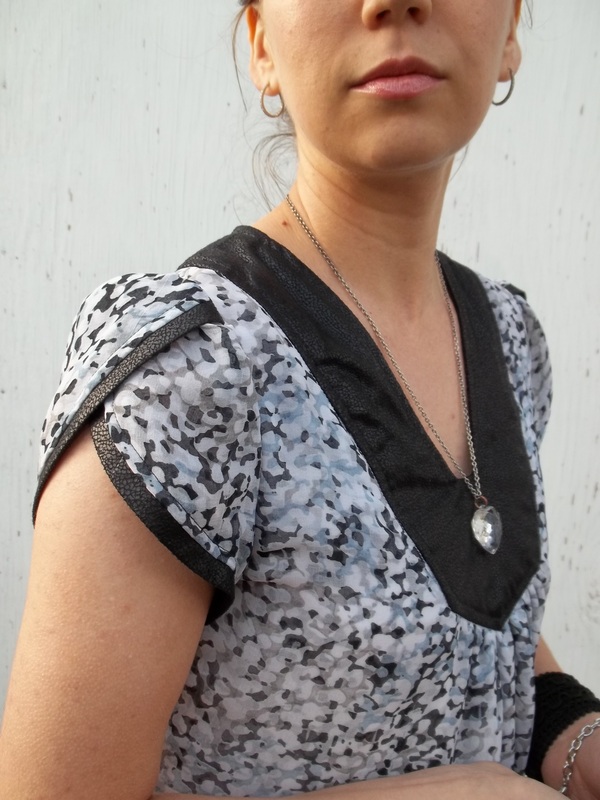 The ¾ sleeves also ended up more of a bracelet length, but once they received a large hem, they look more like a flared end sleeve much like another Burda pattern I made before, the “Comma Dot” pleated placket dress. I did leave out the pattern’s given neckline facing and instead used a simple line of bias tape. This switch turned out to be a rather bad idea as the neckline is a wide boat neck, but I made it work. 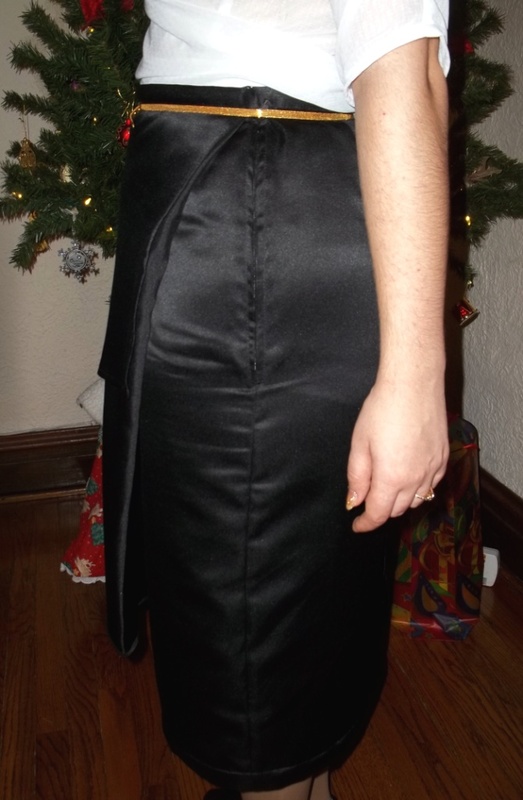 The large bottom skirt hem came in handy for me to fix a problem I had with the dress. You see the lightweight fabric of my dress and the large flowing skirt portion below made me step in the shoes of Marilyn Monroe at her famous “over the air vent” picture in the white sundress where her hem indecently wants to go up to the level of her waist or higher. Yes, whenever the wind blew I found my hands automatically going down to keep my dress’ skirt in place…nobody wants to wear something so fussy you have to be self-conscious in. 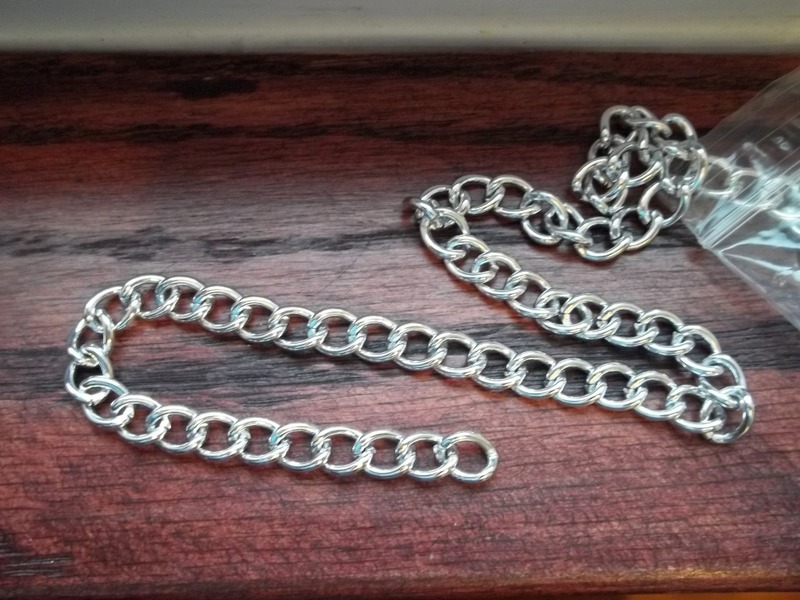 So, I’d remembered hearing of such a thing as a metal chain along a hem to weigh it down, so I went to my local fabric store and bought aluminum (which won’t rust) ¼ inch chain. At first I tried several different methods of stitching it to the hem, but the chin only felt cold against my skin and wrinkled up the hem. Luckily, the large hem to the dress provided a perfect “pocket casing” to hold the chain loosely and out of sight off my skin. I measured the circumference of the hem bottom and transferred that to the chain, then dropped it into the hem “pocket casing” through a little opening in the stitching. Once the chain was wound through I used my jewelry pliers to reconnect the chain at the same circumference as the hem, dropped it in, and sewed up the hem hole. Voila! I couldn’t ask for a better solution. Now, the wind my blow, but it will only succeed in filling up my skirt to look like a bell. Silly wind – can’t make me flash anyone anymore! I also have an even better swishy swing when I move. Yay for new tricks of the sewing trade! I did use an old sewing trick to help, as well. The markings of the pleats were not showing up on my crazy print, and since the print was slightly sheer I completely lined my dress in a black liner with an equal amount of weight and hand – poly pongee. Yes, this step of lining my dress took me twice as long, but the finished product makes it worth it in the end. 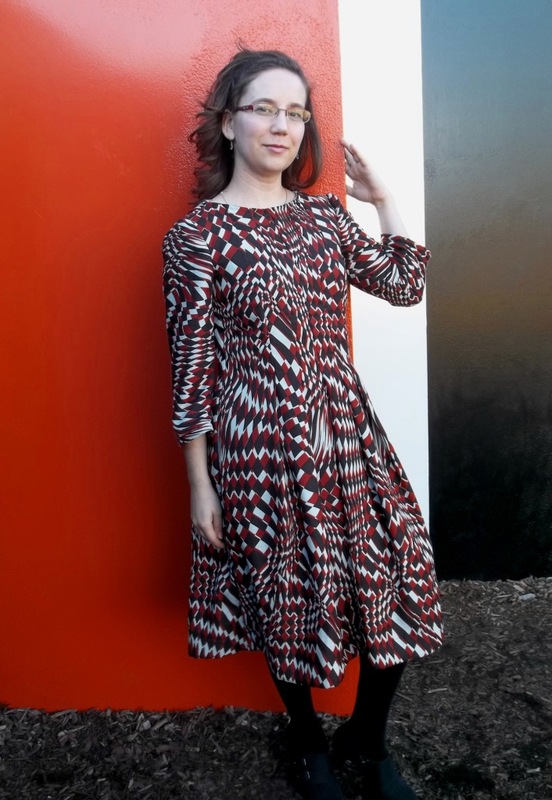 This dress is definitely part of my “Retro Forward with Burda Style” blog series. 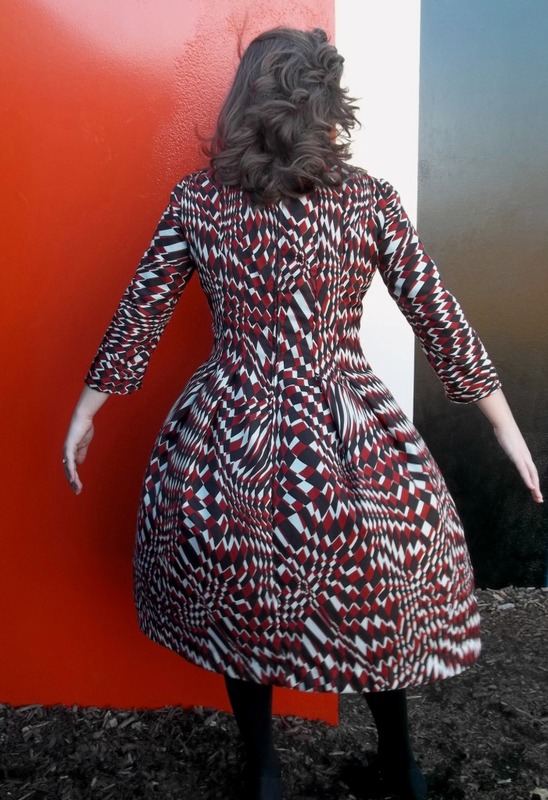 Although my Burda project is modern, I tried to channel the era of the late 1960’s with it…something between an ‘op-art’ dress and a less-sweet twist on a ‘baby doll’. 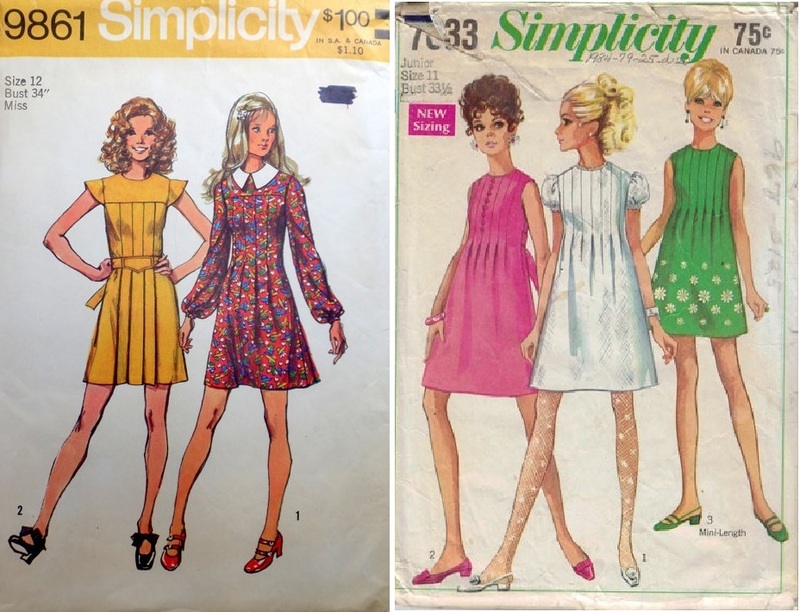 It is in the “Flower Child” era (late 60’s and early 70’s) where I see the most sewing pattern designs using inverted pleats in a fashion similar to this post’s Burda dress (see just two of the many examples I found). 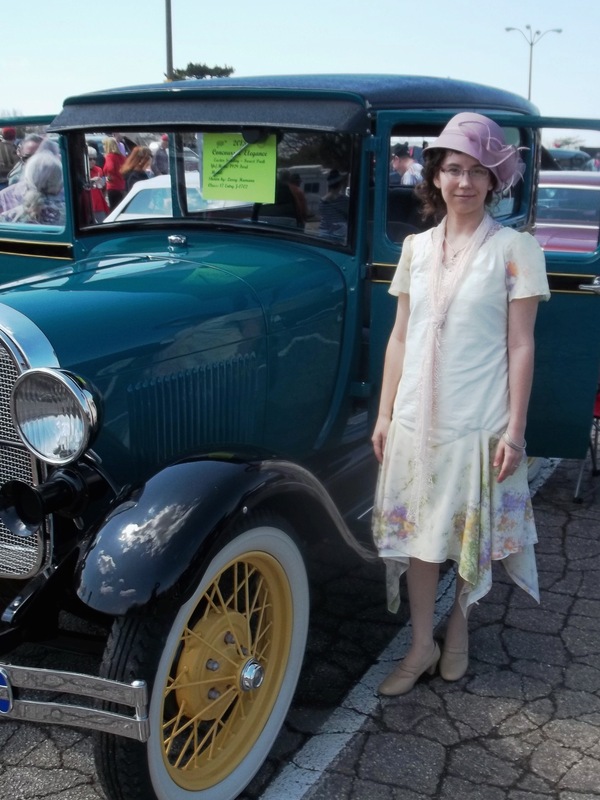 However, on a different vein, the way the bodice is smartly constructed with a bodice-shaping dart hidden in the last pleat near the shoulder, and made above the bust on the chest, is exactly the same method as a year 1937 McCall #9170 which I have already sewn from (post here). Ingenuity never goes out of style! 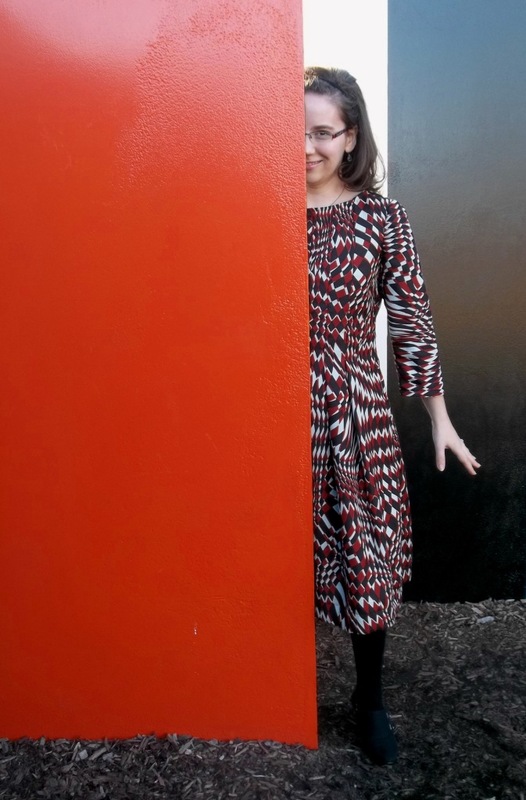 A small, metal walled, color blocked maze in an art themed park is the background setting to our pictures. I thought it helped me blend in, but compliment and contrast in theme, idea, and colors with my dress. Now you see me…now you don’t, just like the pleats in my dress! 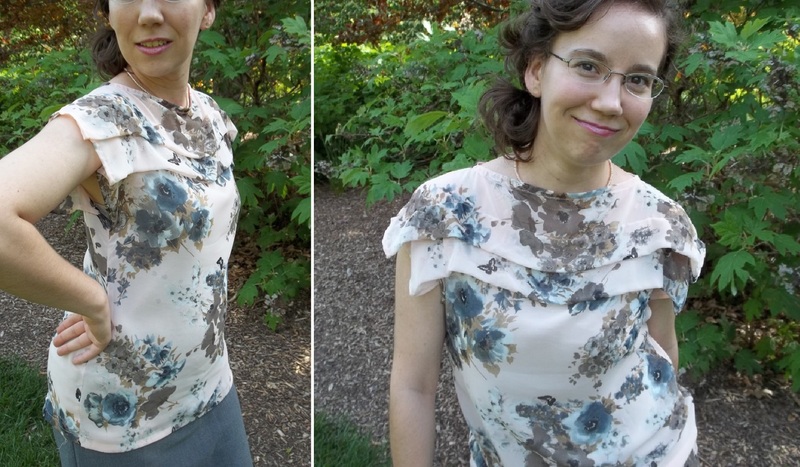 Most blouse patterns I see use pleats vertically as a point of interest. As a change of pace, here’s a simple Burda Style top that uses pleats horizontally to completely frame a simple design and make it amazing. 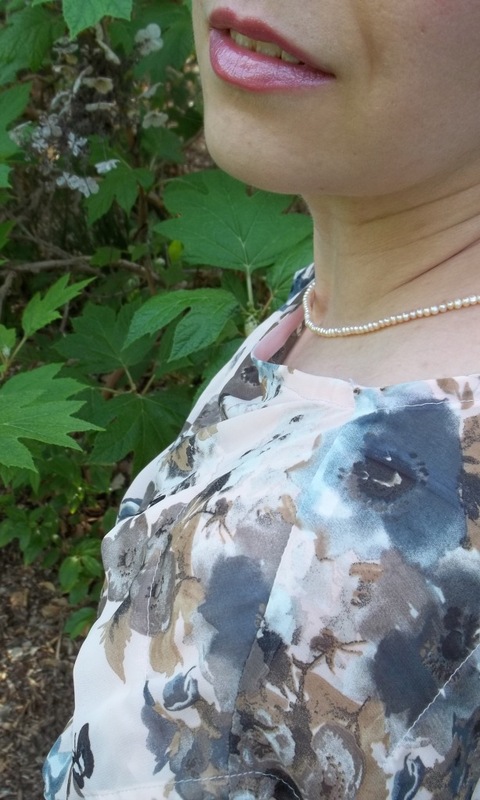 FABRIC: My blouse’s fabric is a sheer and flowing 100% polyester chiffon in dusty pink background with a floral design of white, tan, and multi-toned greys. NOTIONS: Thread and bias tape were all I needed, both of which were on hand already. TIME TO COMPLETE: This blouse took me a total of about 5 hours, and was finished on April 13, 2015. THE INSIDES: The insides are a conglomeration of finishes. The edges of the side seams had to be adjusted and taken in, so they are raw and coated in “Fray Check” liquid. The neck edge is finished in tiny bias tape, the shoulder seams are French, and the bottom hem is wide and double folded. TOTAL COST: This was a clearance ‘remnant’ table item, bought from Hancock Fabrics Store. I bought all that was left, just over 1 yard for a price of about $4.00. The pattern is ingenious – I wish I would have thought of it. The front and the back pieces are each one long basic rectangle with subtle shaping along the sides. The top quarter of that rectangle is the part that gets pleated; it’s also the area from above your armpit to a few inches below the neck. Yes, the pleats do take out a chunk of inches. Those pleats were slightly tricky but, once understood, not as hard as they seemed at first. There are two different strips of marking lines, to bring ‘A’ together with ‘B’. Primarily, I tried to lap the fold under the upper line, but…no…that does not work. The pleat is so simple, I should have seen it. 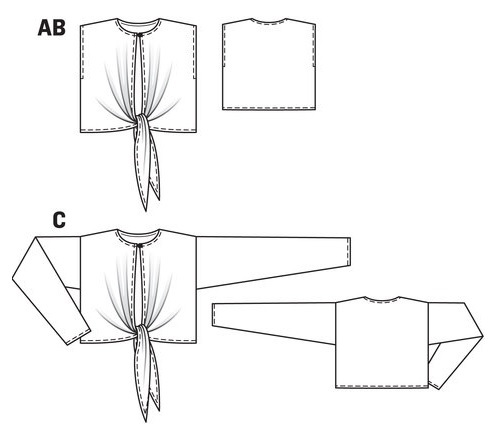 Simply pull out, with wrong sides together, the amount of fabric between the two lines (‘upper’ and ‘lower’) for each pleat until both are lined up together. Then you stitch both layers together on that line so that the pleat hangs down free when worn. Now, the line where you sew the two layers to make the pleat does not go all the way to the end – it stops about 3 inches from the hemmed edge so the sleeve ends hang open more softly. I love the way that the two pleats have such symmetry and the way the top one’s fold ends just barely over the stitching line of the second lower one. 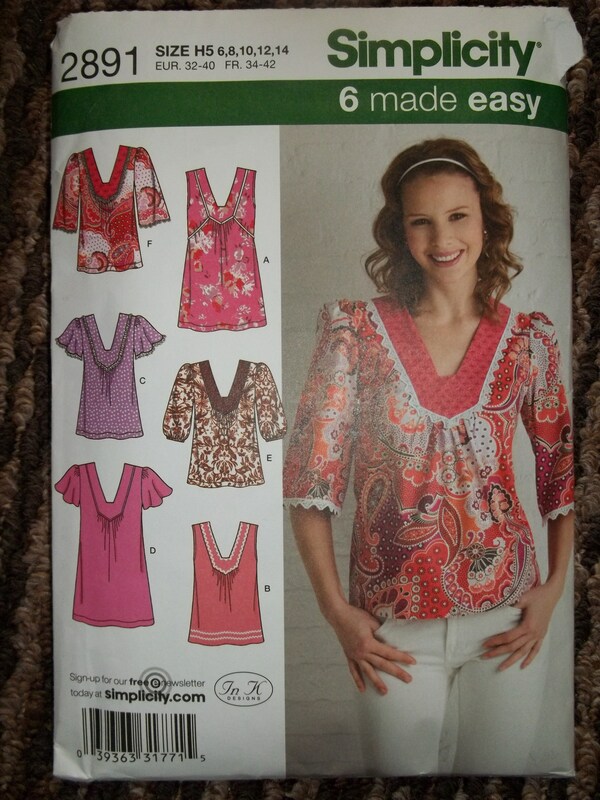 Since this is a pullover blouse, I made the size I am accustomed to using with Burda Style patterns. However, I ended up taking the sides in by about another ½ inch on each side, so I could have made a size smaller, anyway. This is just my personal opinion or taste that the pattern seems to run a bit roomy. I feel the fit of my blouse is still roomy but slightly fitted, just the way I like it. I did make a wide hem at the bottom because the length according to the pattern almost could have been a little mini dress. That would not look bad either but I wanted a top to be a top, if only a tunic. 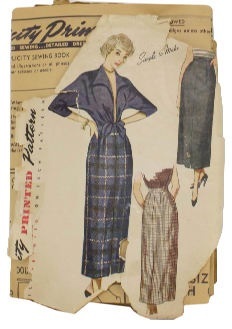 The “Pleated Blouse” has a wide oval boat neck. I love the beauty of it, but the lightweight fabric tends to make it droop around my shoulders somewhat – front, forwards, and the sides. I also loved the challenge to get the sharp curves in the corner with the bias tape facing. I’m happy with how it turned out. Such a simple design of large pleats and oval neckline creates a wide shouldered appearance. 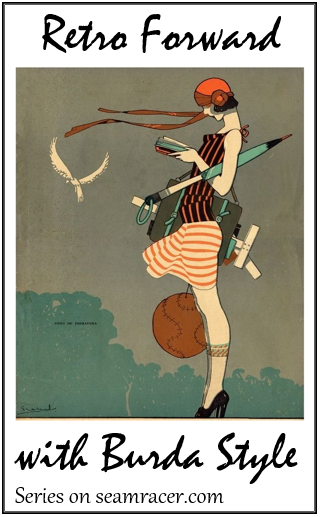 This is part of the reason why this project is part of my “Retro Forward” Burda Style blog post series. 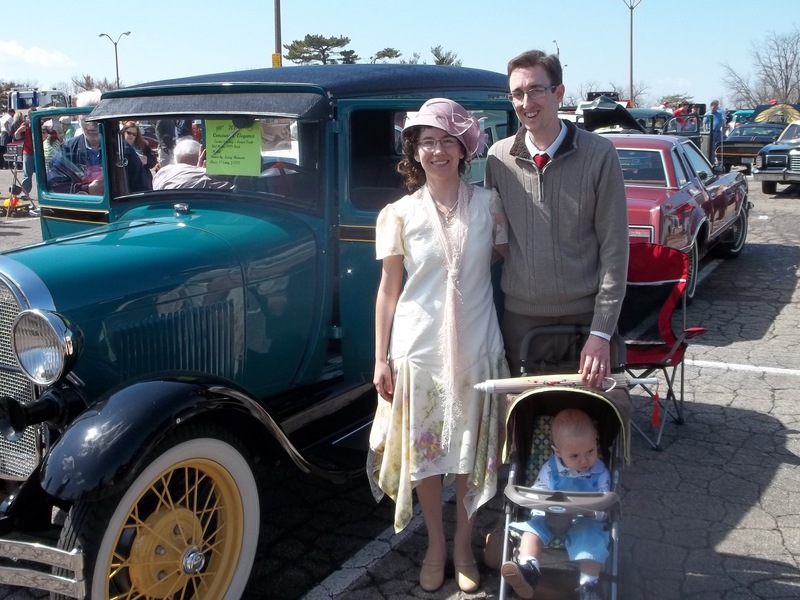 The decades of the 1930’s and 1940’s (as well the 1980’s) exaggerated the width of the shoulders by the design of their fashions. 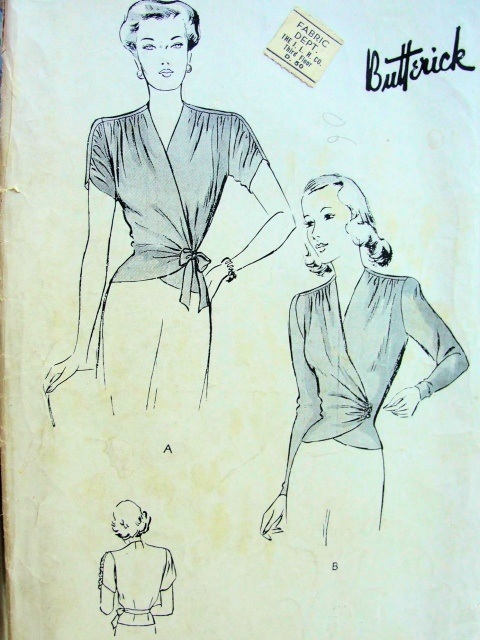 For my first comparison, I found a pattern from 1946, McCall #1954, and Butterick #4074, year 1947, both of which are strikingly similar to the Burda Style “Pleated Blouse”. 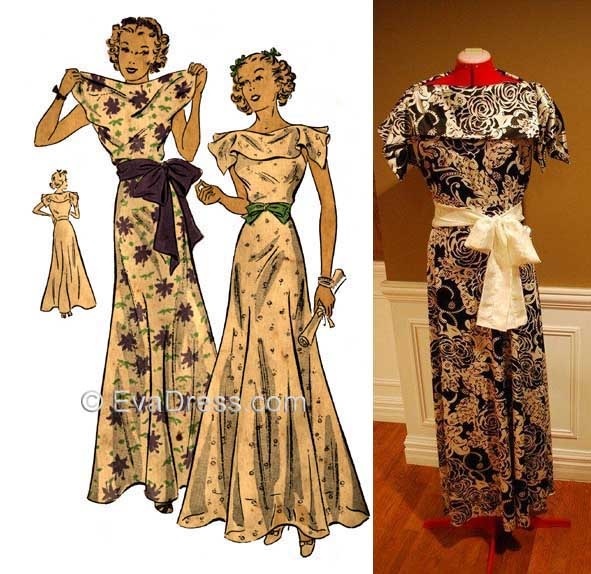 Then there is a 1936 pattern, an Eva Dress reprint #1655, with one humongous horizontal pleat of fabric hanging down from the shoulders. Both patterns take an otherwise simple style which gets an overstated horizontal pleat for the perfect combination of complimentary features. 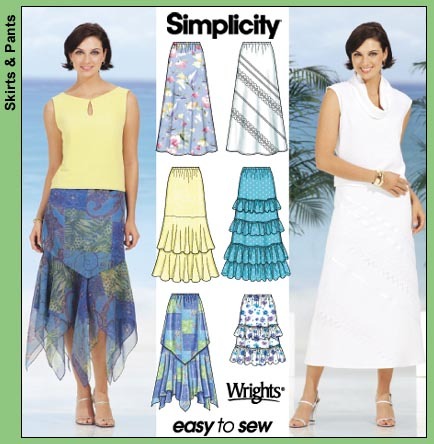 The main difference I see is that Burda Style doubles the pleats. 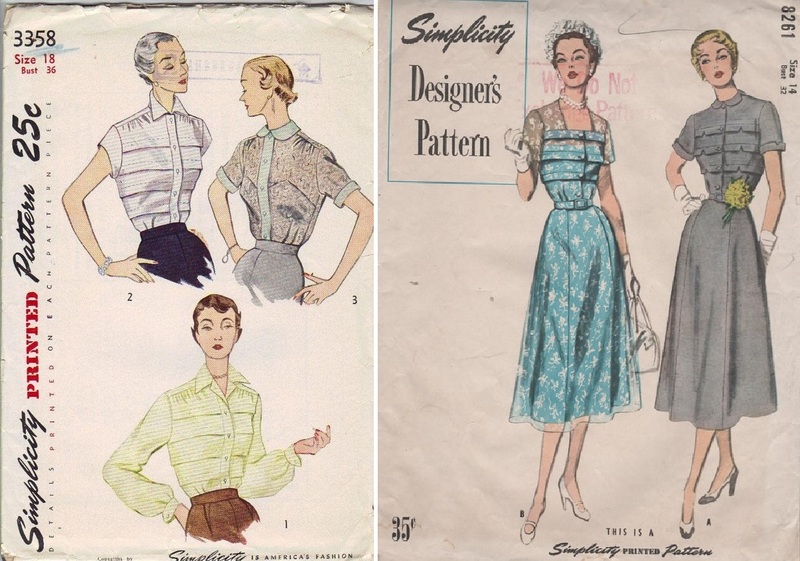 Also, besides the closure differences, the vintage patterns have a tad more bust shaping, like darts or bias grain, versus the straight lines of the Burda top. 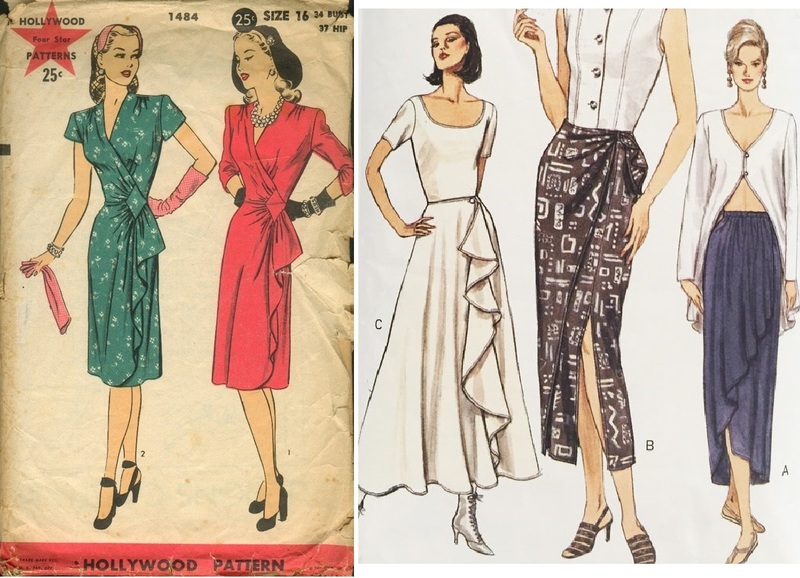 The 1950’s decade used horizontal pleats, too, but mostly (but not always) they were used on skirts to visually widen hips for the “New Look”. 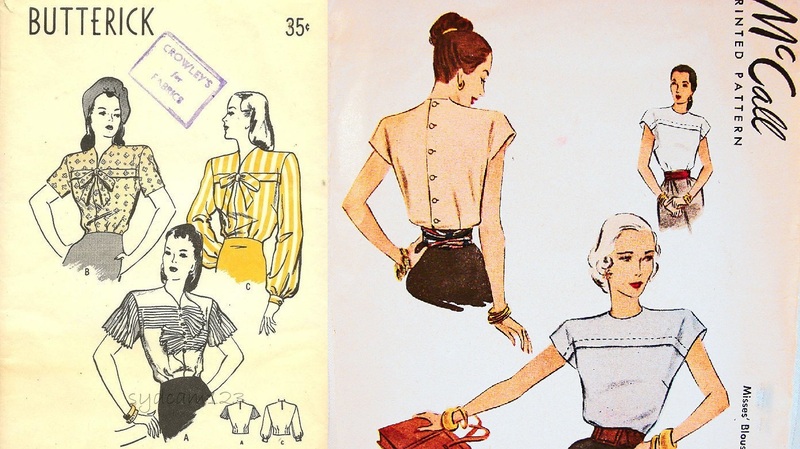 When the 50’s used horizontal pleats on blouses, I often see them as consecutively spread throughout the length of the top (see Simplicity patterns #3658 and #8261, both from 1950). 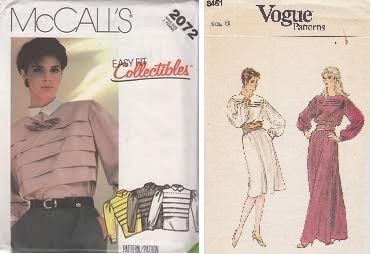 Pleats in the 1980’s were, well, all about big blousy bodices and power shoulders (Vogue #8451 and McCall’s #2072). 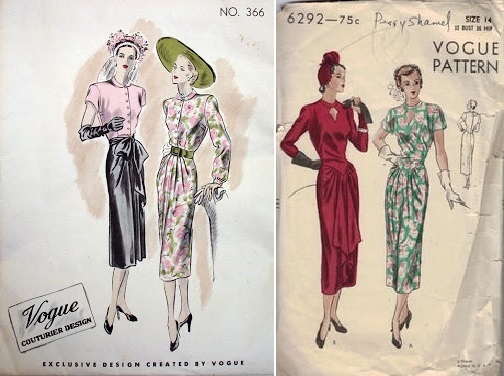 Perhaps in the future I will build on the ideas these vintage patterns provide and adapt this Burda design to try other variations of beautiful horizontal pleats as used over the past decades. This was my special Mother’s day outfit for what was a beautiful spring here in our town. 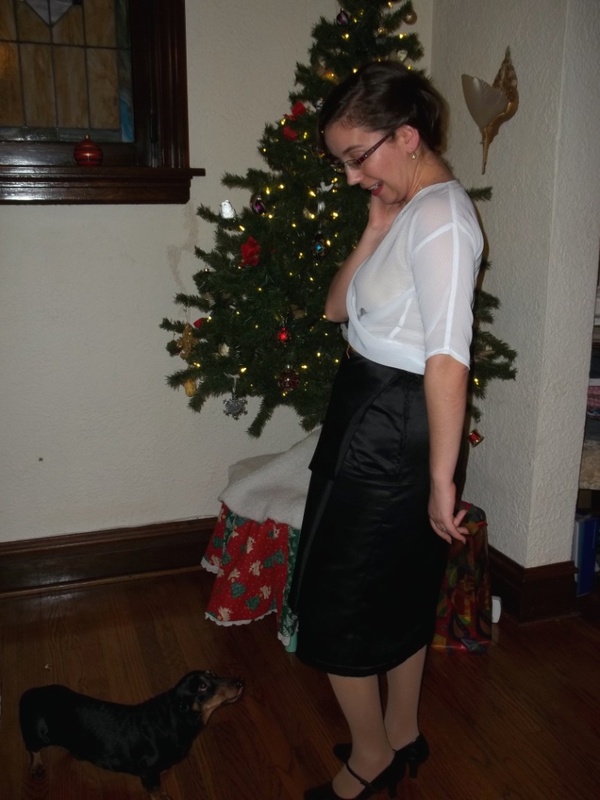 I splurged just the month before and bought the awesome pink 1940’s peep-toes heels you see on my feet in our pictures. 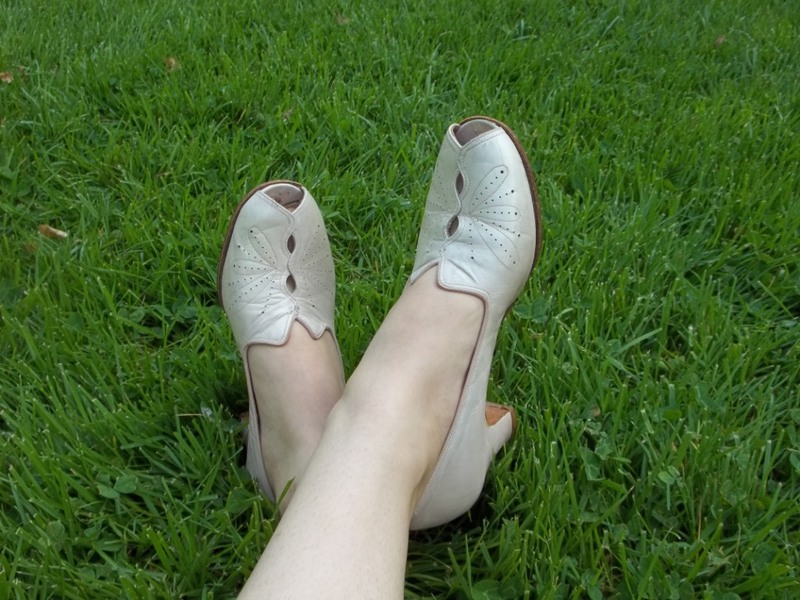 My shoes are as comfy as house slippers, in my perfect size and in perfect condition with meticulous attention to detail in the swirling perforations on top and the Petersham ribbon edge finishing. I think my pink peep-toe heels matched beautifully, as well as brought together the 1940’s era influence of the style and silhouette of my outfit. 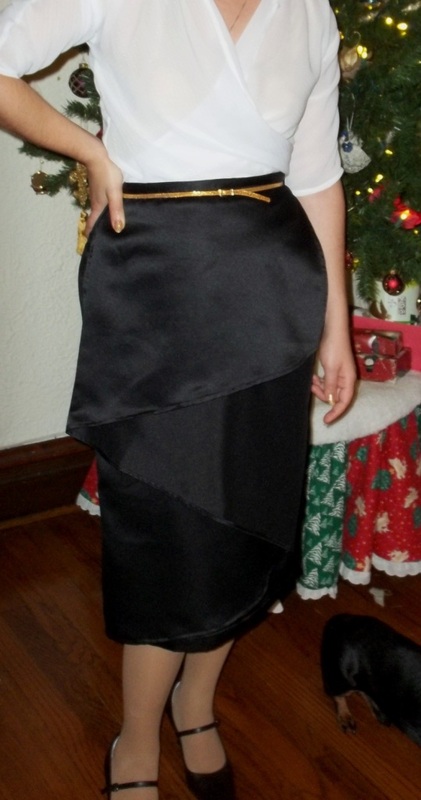 My skirt is not made by me, but an old favorite standby item which came from a re-sell-it store (also called op-shops). It actually stretches and the wide waistband made my grey skirt wearable for the time I was expecting our son, so this also makes this perfect for my mother’s day outfit. I have found that other colors of skirts work well with my pleated blouse, but I think a slim pencil skirt works best with this top style, and the grey neutralizes and tones down the pastel colors. This has been a go-to easy care nicely dressy piece in my wardrobe this spring and summer. 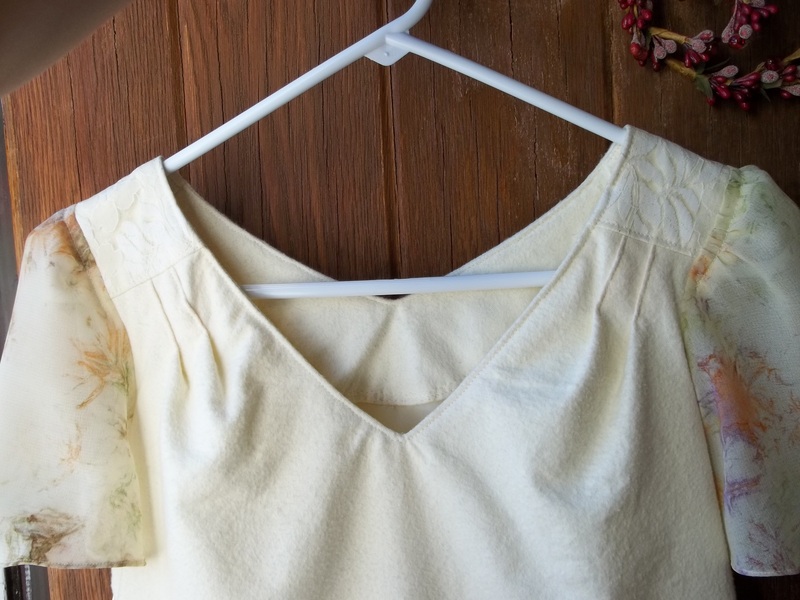 It is a blouse that is special to wear, instantly looks nice, and does not need accessories to look great, as well as an easy-to-make challenge. So many times I am surprised in a good way by the simple, yet interesting pieces I make, and this Burda Style Pleated Blouse is no exception. Easy patterns are good and have their place, but detailed, special, and ingenious designs are almost more crucial – they push limits and challenge talents. To find a combo of both easy/simple and detailed/challenging (like the Pleated Blouse) is a special find for all skill levels. Most importantly, however, I feel we need to acknowledge where some of the design elements for self-made fashion come from in our past. Keeping an understanding of the history of fashion grounds current fashion, placing ‘trends’ in proper perspective. Many times I have special vision when sighting a rather disappointing pattern envelope cover. Somehow I can see past the wrong fabric or trims or styling that was chosen. Maybe I can see the creative potential of patterns because I love being artistic and thinking outside the box…who knows. Nevertheless, this leather and chiffon dress was definitely one of those surprising, creative, out-of-the-box projects which turned out to be wonderful staple I turn to wear frequently. It feels so nice to have a quite distinctive modern dress when I’m not in vintage wear. 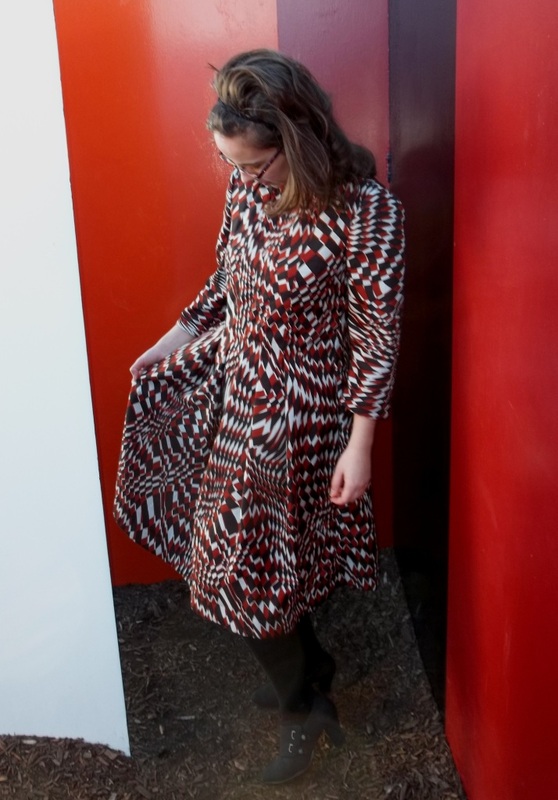 To make my ‘complimenting contrast’ dress even more associated to Sew Weekly, I took my inspiration from an amazing contributor to Sew Weekly, Kazz Pell of Australia. She recently stopped blogging, so I’d like to dedicate this post to her and to everyone else who proudly loves to wear one’s own art. 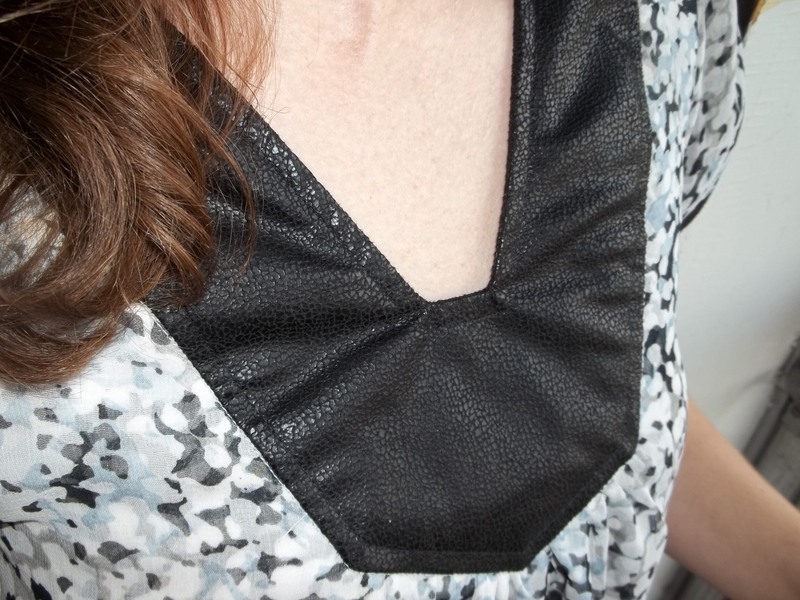 FABRIC: One yard of faux leather fabric for the neckline and sleeve trim. 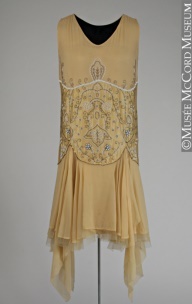 Four yards of polyester sheer printed chiffon were bought for the outer dress. The chiffon is a very loose weave animal-style print with black, grey, light blue, and white colors. White rayon challis is the under dress, lining the sheer chiffon. NOTIONS: I had everything on hand, but I didn’t need anything out of the ordinary, anyway: black thread, white thread, sharps machine needles, interfacing, and white bias tape. 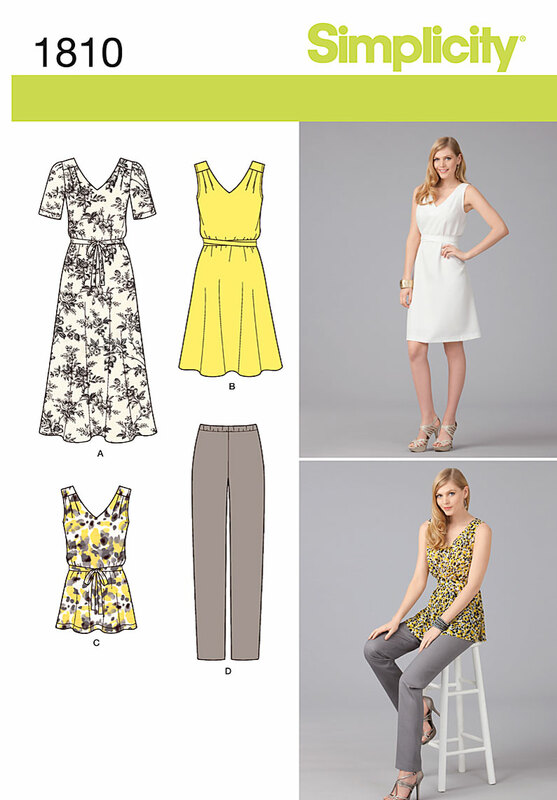 PATTERN: Simplicity 2891, year 2008, without the pattern’s sleeves or bust ties and lengthened by about 12 inches into a dress length. 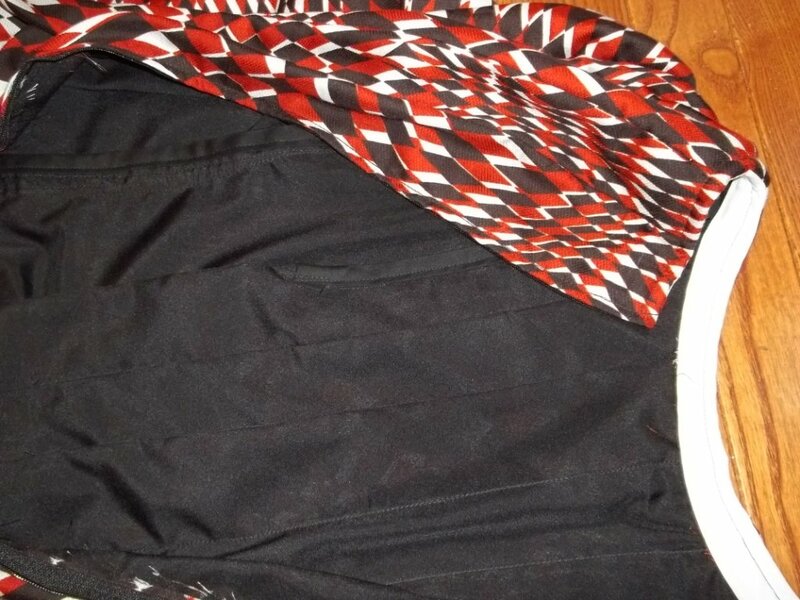 TIME TO COMPLETE: My dress was finished on March 9, 2013, after not much time to complete, maybe 8 hours, 10 at the most. THE INSIDES: Except for the sleeve seams, which are covered in bias tape, all other seams are French seams. Of course the hems aren’t French, just tiny 1/8 and 1/4 inch seams. 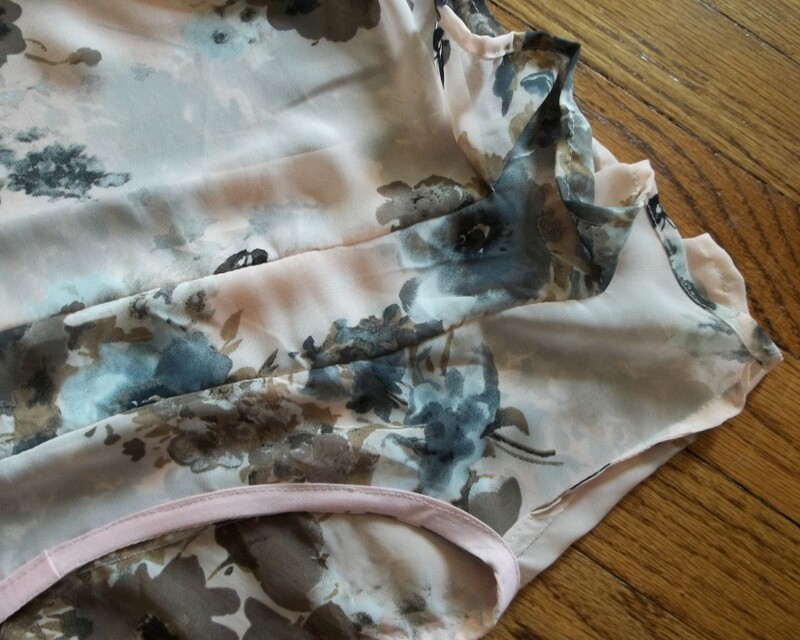 The neckline has self-fabric facings, so the inside is as cleanly finished as what you see from the outside. TOTAL COST: All fabrics were picked out and bought back in early 2012, so I don’t exactly remember all the totals. I believe my dress probably cost $30, more or less. Compared to the tacky, outdated top sewn up and modeled on the pattern envelope front, my finished dress is, I feel, a tremendous improvement which gives Simplicity 2891 some of its due justice. Nevertheless, compared to Kazz’s original “Bamboo Banga Dress”, my dress is just a poor, toned down version of a knock-off. This was what I was comfortable with and came up with using my own style of ingenuity. I do, however, owe my leather and chiffon dress to Kazz, in the way that her artistic taste and sewing abilities are so awesome, she inspired me to try a mix of fabrics completely new to me and explore my creativity, too. That’s the best thing about the sewing blogger world – we inspire and encourage each other to grow and learn! 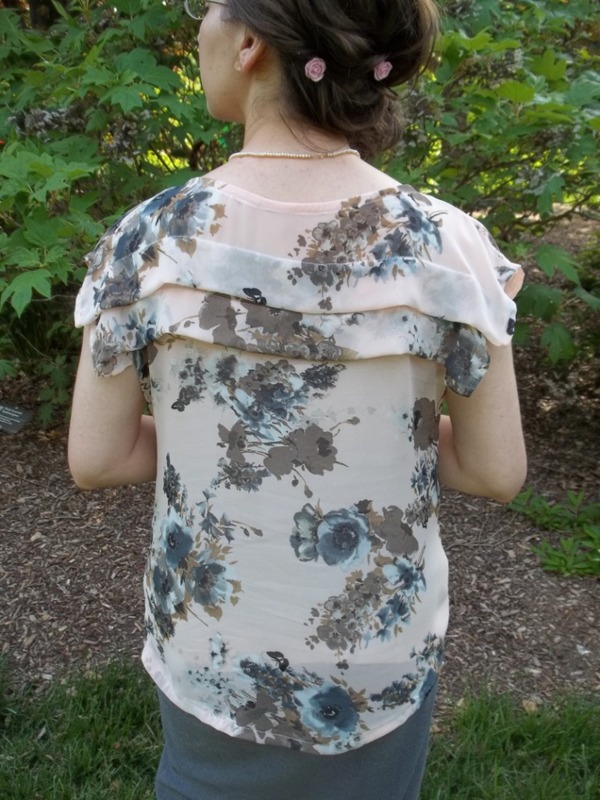 Kazz gave me the wonderful idea to double up the printed chiffon to create an off-inked appearance like when the layers of printed colors are miss-matched. Thus, I had to buy double the amount called for in the pattern, and extra, as well, to lengthen the tunic into a dress. Buying double was a bit more costly than I wanted, especially when combined with the faux leather fabric and the rayon challis under-dress. I did not want to wait until the perfect fabric was gone before I decided to go buy it! My idea needed to be sewn together in real life, not just in my head, and I’m glad to be able to enjoy wearing this dress. Discount coupons were used on the material to help my dress be totally worth every penny! 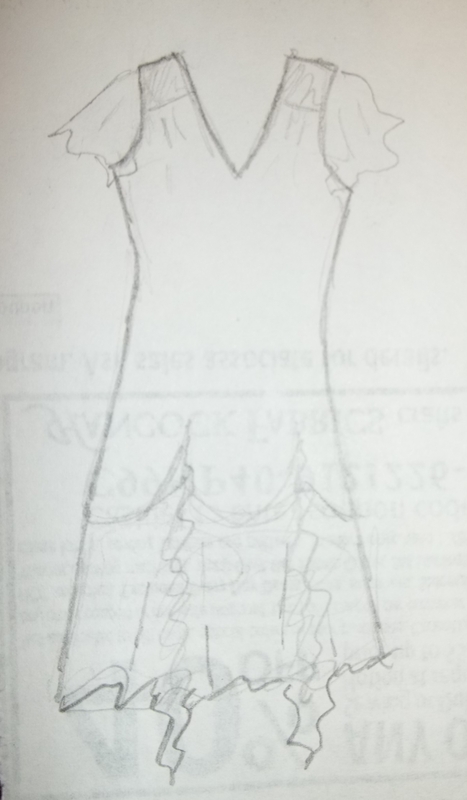 Like I had said above, I lengthened the tunic by about 1 foot (12 inches) to make it a decent tunic dress for my taste, and this took some redrawing of the bottom half of the pattern. I also did my usual drastic grading between sizes (such as here and here) to make sure I didn’t end up with an over-sized, ill fitting sack for my sewing time and trouble. The center front gathers (under the neckline placket) were left as they were on the pattern, even though I considered taking out an inch or so to avoid any possible silly bust fluffiness that sometimes happens with such a design element. 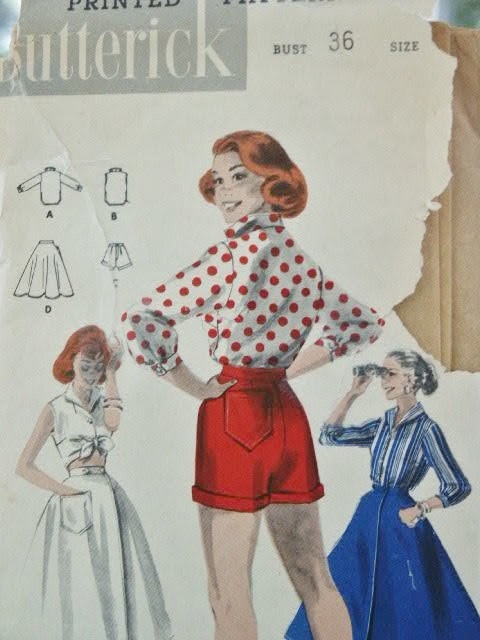 Now, remember, I had to cut out 3 tunic pieces – 2 from the chiffon and 1 of the rayon – so I was glad to have the main body pattern be two very simple and easy, slightly shaped squares which get cut on the fold. There was minimal marking to make, also. I only chalked on the rayon under dress, and used thread to mark on the chiffon. It was just a tiny bit challenging to work with all three of those fabric layers together while making my tunic dress. The two layers of chiffon were stay-stitched to the rayon under layer so I could finish the neck, its gathers, and the neckline placket. Next, I tacked the armholes together to sew on the petal sleeves that I drafted for my dress (I’ll address more about the sleeves in a bit). I was kinda being too much of a perfectionist when trying to smooth out and match the two chiffon layers when it came to doing the bottom hemline, but I pinned while my dress was hanging free from a hanger. A few days (just a few) were taken up just putting off doing the hem, so I could look at my hem pinning job and smooth it out again just to re-pin and overall uselessly obsess. In the end, I tacked the hem together with a loose stitch so I could finish the chiffon hem in a tiny 1/8 inch hem then try to perfect and match up the rayon under dress hem. In lieu of a label (like what’s on store bought RTW clothes), I kept a selvedge edge label along the vertical side seam, right at about the hip/upper thigh, on the chiffon fabric of my dress. 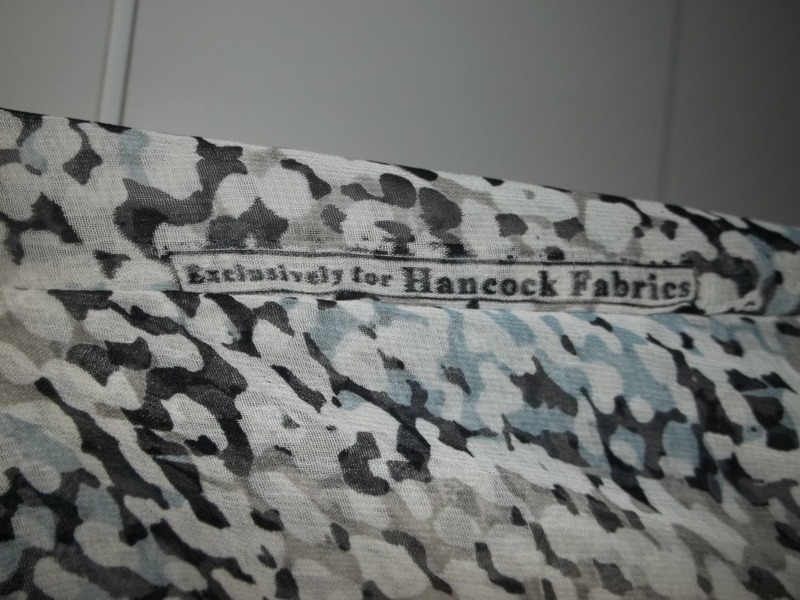 It plainly displays, in rather subtle, but obvious words for those who know, “Exclusively for Hancock Fabrics”. That store don’t carry already made clothes, people! There isn’t any thing better than advertising my favorite fabric store to others. I really tend to prefer the Hancock Fabrics exclusive fabrics…they tend to have the best hand, print design, and value out of all the other fantastic items they carry. I will have to include this selvedge label method again. At first, I was nervous about working with the faux leather, after reading Kazz’ point about her small stitching line being similar to a line of perforations, giving a slight doubt as to whether or not the dress will hold together well. Mindful of her experience with real leather, I sewed on the faux leather with a long straight stitch line, and was careful to get things right the first time (so I wouldn’t have to unpick and leave holes). Adding interfacing to the back of the faux leather was tricky and almost impossible, but I wanted the neckline stabilized, so I made it stay (somehow) in the end. A Teflon (walking) sewing machine foot wasn’t needed, or even any wax paper, since the faux leather had a slightly brushed, softer finish with shiny patches, like a sort of snakeskin. I made sure to use a new sharp needle in my machine because an old needle might not glide through a tougher fabric as precisely. Yahoo! My first experiment with an ‘inexpensive and easy-care alternative’ to leather turning out so nicely has given me more confidence to attempt a try at working with the real thing in the future. Another one of my sewing hurdles was passed and conquered. I just could not bear the thought, or even the idea, or doing the sleeves that are shown to go with the pattern. Ugh! I knew I didn’t want a sleeveless option, either. 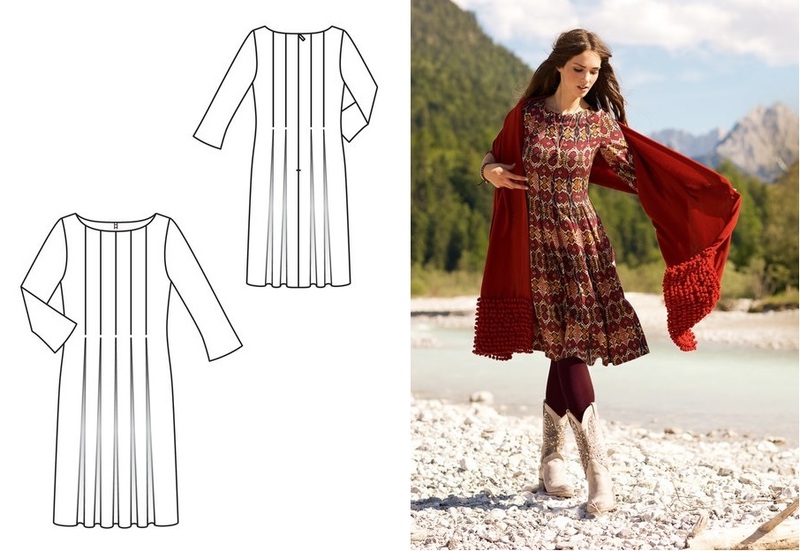 My dress seemed to me to need an added interest…sleeves which would perk up the design by being different but without getting distracting from the simplicity of a tunic dress. Thus, it occurred to me to use yet another new technique on my dress – petal sleeves. I have been wanting to do this type of sleeve on an outfit of mine for quite awhile (since 2011). 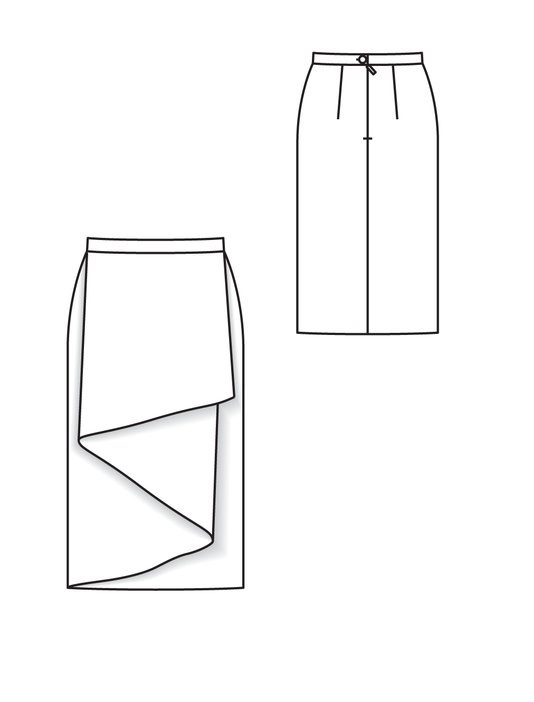 All this time I had bookmarked a web page which gives an excellent tutorial on how to adapt your favorite classic cap sleeve pattern piece into a re-drafted petal sleeve. The step by step petal sleeve tutorial can be found by clicking here (@ My Sparkle blog) and it is full of pictures, very clear, and quite easy. I used the basic cap sleeve pattern piece from a past made project of mine, a McCall’s 6433 “Red Flame” knit sweater dress. I had already fixed this sleeve piece so it would fit my larger upper arm, so I traced it out onto some leftover paper from a torn trash bag, then got to work adapting it into a petal sleeve pattern cut out of wax paper (since I could see through it) and marked with a sharpie pen! I was just trying to be smartly economical with whatever was on hand. The petal sleeves are everything I hoped they would be, both for the balance of my dress’ image and for a wonderfully comfy fit. The two overlapping sleeve pieces allow for full freedom of movement, which I can always use because of my thick upper arms. However, at the same time, someone with thin arms would also love petal sleeves as well because of the way they fold over (like a flower) to fit you so beautifully when not opened up by movement of the arm. Petal sleeves were on the dresses of my bridesmaids in our wedding, and I thought they were so pretty then…but now I’ve made my own! Strips of the faux leather were cut out, folded over and added to the edges of my dress’ petal sleeves to highlight the crossover pieces and finish off the hem edges nicely. Faux leather on the sleeve edges gives a great finishing contrast to my dress in more ways than one. Leather is seen as something tough and masculine and durable, thus to use it to bring out the beauty of a sleeve, made out of the sewing world’s most delicate and feminine fabrics (chiffon), named after the most fleeting beauty of a flower (its petals), provides an amazing and curious irony about my dress that I find very appealing. Maybe the reason why I love this contrast of fabric, image, and ideal has to do with me: deep down there is a small wild part of me that enjoys an equally small part of the punk music listening/motorcycle babe/modern feminism crowd. As an example, it’s a shame you really can’t see in our pictures the fishnet stockings I wore on my legs and my chain jewelry worn to match my dress in the above photos. I did try to “dress up” my dress in a toned down, classy way, as you can see in our other picture here (at right) showing me sporting pearls at my neck with a suede belt and strappy flat shoes. 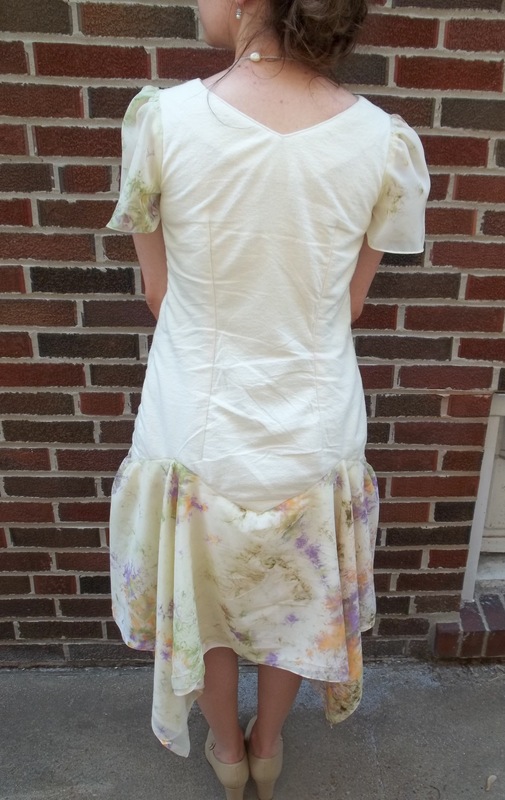 There is more than one way to wear this dress, but the hip and funky way, like what Kazz sports, is definitely my favorite with this leather and chiffon project. Inspiration comes in all shapes, colors, places, and media. 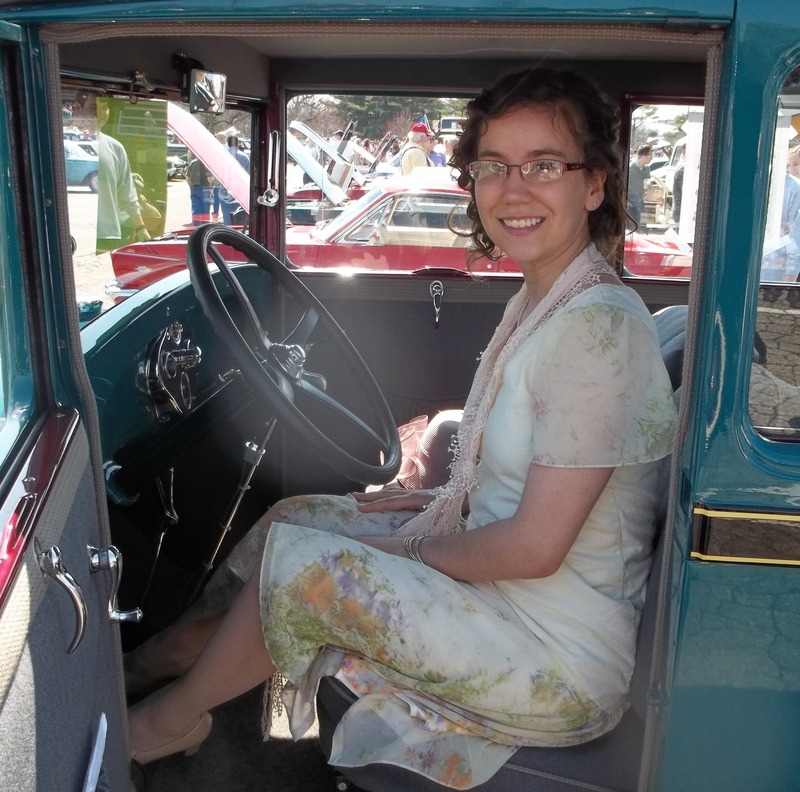 Kazz Pell’s blog and her participation in Sew Weekly showcased her talent and let others, like myself, look and read with a hope for catching a bit of that inventive spark. Let something inspire you and make it your own – be it an old family photo, a painting or even a song. The world needs creative people like us!